The blocker doesn’t have full control. On most sets, the hitter can beat the blocker with the right shot. It’s possible to make a good block and still have the hitter kill the ball. Many attacks never touch the block. At some levels, over half of attacks will touch the block, but at lower levels (such as high school), more than 3/4 of the attacks will go clean past the block. It’s difficult to evaluate the effectiveness of a block when the blocker doesn’t touch the ball. There are lots of non-terminal blocks. At the NCAA women’s collegiate level, only about half of block touches are stuffs or tools/errors. It’s not always clear whether a “block touch” (that doesn’t result in a point for one team or the other) is a positive or negative play. It can be difficult to separate the performance of the player from the system they play in. The standard box score in the USA, the NCAA box score, is mediocre at best at giving you blocking information. We talked about the last point, and we saw that adding block errors/tools to the equation gives you better information with which to evaluate your blockers. Teach players that their number-one job as a blocker is to stuff the ball. But the next most important thing is to not give up an easy point by getting tooled! Understanding both sides of this equation makes blockers better. But what about point #2? Many attacks never touch the block. In this match, Texas defended 112 BYU attacks. BYU made unforced errors on 9 of those balls, and the Texas block touched 50 of them in some way, which means 53 of 112 BYU attempts, or 47%, were untouched by the Texas block. On the other side of the net, BYU defended 90 Texas attacks. 6 were unforced errors and 37 were touched by the BYU block, which means 52% of Texas attempts were untouched by the BYU block. What do we do about all of these non-touches? There is a bigger gap between Texas and BYU in my app than in the Volleymetrics grading. Both teams have a lower ratio in GMS Stats than in Volleymetrics. One of the great things about advanced programs like Volleymetrics or DataVolley is that you can drill down deep into things like this. When I was with the USA National Team, we had a system for evaluating Blocking Efficiency that we called, “Expected Attacking %.” In this stat, we had 6 different grades of block touch, including a tag for, “No Touch,” where the hitter hit a ball hard past a blocker and the blocker failed to get a touch on the ball. In this system, the “expected efficiency” of each touch (except stuffing the ball or getting tooled) is always some fraction of a kill; remember that even good touches that slow the attack down are mishandled by defenders sometimes and even poor deflected touches are dug sometimes as well. This allowed us to get precise values for how a blocker affected an opponent’s ability to score against her. Unfortunately, most high school and club coaches don’t have dedicated statisticians or the budget for advanced statistics software! That’s why I don’t use a fractional system for blocking in the GMS Stats app. A primary responsibility system is easier to keep track of, because blocking touches are only assigned when the rally ends- either with a kill or stuff block. While this is not a straight-down kill, it’s also a difficult play for the defender. Many coaches would be tempted to just call it a “good hit” by the attacker and leave it at that, but I think you’re missing some information. I decided to assign responsibility to the left-back defender. Let me know what you think in the comments section. In summary, there’s a “Goldilocks Zone,” for most volleyball statistics where getting the right data can get you 90% of the information you need, but getting that last 10% of information requires massive resources. For NCAA and professional teams, that can be a worthwhile expenditure of resources, but most high school and club coaches just need to get the most bang for the buck! Not Enough Info: Only keeping track of stuff blocks. Too Much Time/Energy: Using a fractional grading system to capture the value of every blocking action. Just Right: Track stuff blocks and blocking errors, and use a primary responsibility grading system to capture a few additional non-touches that the block was responsible for. In Part 3 of our series on Evaluating Blocking, we’ll dive deeper into non-terminal block touches and try to find out how much they really matter. Two of the most difficult skills in volleyball to evaluate statistically are blocking and digging. We’ll discuss defensive evaluation in another article; today we’ll focus on blocking. There’s a lot to unpack here, and we’ll need more than one article to really discuss blocking. Let’s start with the last point first. 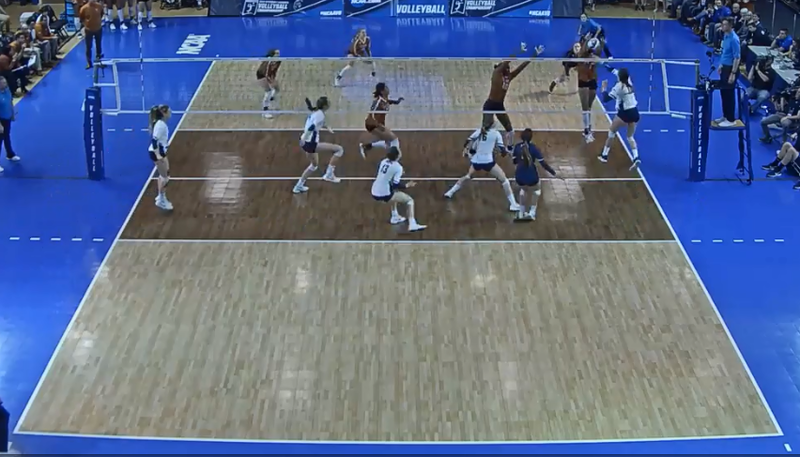 We’ll take a look at this NCAA tournament match between BYU and Texas. The blocking information here is contained in the columns BS (“block solo”) and BA (“block assist”). The first thing you realize is that these distinctions are almost meaningless in modern NCAA volleyball, where almost every team is in some sort of help-block system. Between the two teams, there were 24 stuff blocks, and only one was scored as a solo. A block assist (BA) is awarded when two or three players block the ball into the opponent’s court leading directly to a point. Each player blocking receives a block assist, even if only one player actually makes contact with the ball. This isn’t to diminish the efforts of the Texas or BYU middle blockers. Their job is to try to get involved in the play as best they can. Middle blockers can and do block balls when they are this late by hitters who hit the ball low into the sharp angle. But on these particular plays, it’s difficult to say that both players should be credited with an equal impact on the play. It also happens (although not in this match) that middle blockers will stuff a quick attack and one of the wing blockers will take part in the block enough to get credit for a block assist, although they were barely off the ground at hitter contact. International blocking statistics do a bit better, as they only credit one player with the block. The FIVB statistics also add an “attempts” category, which is every touch the blocker made in that match. Just as hitting efficiency has a higher correlation to winning than just kill %, blocking efficiency has a higher correlation to winning than just recording stuff blocks. BYU vs Texas Blocking Statistics, courtesy of Volleymetrics. 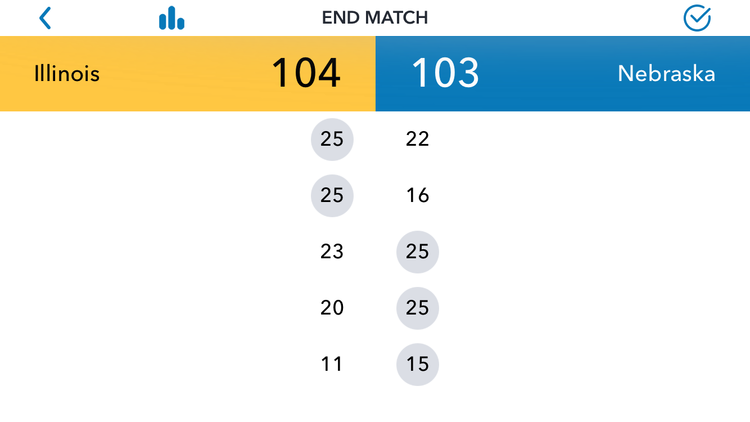 Although the traditional box scores might be lacking, using more advanced statistical programs like DataVolley or Volleymetrics can give us more insight into what happened on the blocking end. Quite a few individuals see their blocking statistics change. For Texas, Butler was credited with 4.5 blocks (9 BAs, each worth 0.5 blocks) by the NCAA but 7 by Volleymetrics. On the flip side, Johnson dropped from 3.5 (7 BAs) to 3 and Gabriel and Eggleston dropped from 2 BAs each to 0. BYU also sees some similar changes based on who actually made the block on each play. Where it really gets interesting is when blocking errors are factored in. However, look at the blocking error column. This includes the blocker being in the net, as well as the hitter tooling the block. Texas had 16 and BYU had 9. Now things don’t look so lopsided. In terms of a raw +/-, both teams gave up 1 more point via blocking error than they scored via stuff block. We could also measure this in a ratio or efficiency rating, by dividing stuffs by tools. In this case, Texas was 15/16 = 0.94 and BYU was 8/9 = 0.89. I call this ratio blocking efficiency, stuff-to-tool ratio, or just, “Stuff to Tool.” This is a stat that few people use that automatically upgrades your understanding of blocking effectiveness, both on the individual and team level. It’s reasonable to assume that stuff blocking correlates well with blocking efficiency, just as kill % correlates well with hitting efficiency. But just as some hitters are high kill and high error, some blockers are both high stuff and high tool. This statistic also helps us coach. Teach players that their number-one job as a blocker is to stuff the ball. But the next most important thing is to not give up an easy point by getting tooled! Understanding both sides of this equation makes blockers better. This brings us back to another reason NOT to use block solos and block assists. Using the NCAA logic for assigning block assists to any blocker involved in the block, whether they touched the ball or not, we’d have to assign block errors to any block involved in the block, whether they touched the ball or not. This strikes most people as absurd, so why are we assigning block assists to both players when only one made the block? Block assists are almost meaningless. The FIVB method of assigning the block only to the player who blocked the ball gives more accurate information. Both NCAA and FIVB statistics neglect at least half the story by only listing stuffs and not blocking errors. Blocking efficiency (stuff-to-tool ratio) gives us a much clearer picture of a team or individual’s blocking effectiveness than just stuff blocks. In Part 2, we’ll look at how the GMS Stats App analyzes blocking, why it’s different than Volleymetrics, and what to do about all those pesky non-terminal block touches! In a previous blog post we showed the Point Differential screen of the GMS Stats App. But what is Point Differential? Why does it matter? How does it affect me as a coach? Calm down, unnecessarily sarcastic imaginary reader. This screen from the app actually shows Sideout Differential, which gives us a little bit more information. This screen shows Nebraska (“your”) Sideout and Illinois (“Opponent”) Sideout. What’s the difference between Sideout Differential and Point Differential? It’s really just a matter of perspective. “Sideout %” is the number of chances we had to sideout (also: the number of times the opponent serves) divided by the number of times we actually sideout. So if the other team serves 100 times, and we sideout 54 times, our Sideout % is 54%. So Sideout Differential is just a way of looking at Point Differential from a different perspective. You cannot have a better Sideout % than your opponent, but a worse Point Differential. And you cannot have a better Point Differential than your opponent, but a worse Sideout %. So why use Sideout Differential instead of Point Differential? In both these matches, the Differential was 1%, but the style was different. Match 1 was a defensive battle where both teams were going on runs. Match 2 was more of a sideout battle, with the offenses at an advantage over the defenses. Knowing the differential as well as the overall sideout rate between the two teams allows you to get an idea of the overall level of play, as well as how your team fared. In Part 2, we look at more uses of Point or Sideout Differential and go from looking at one match to multiple matches.